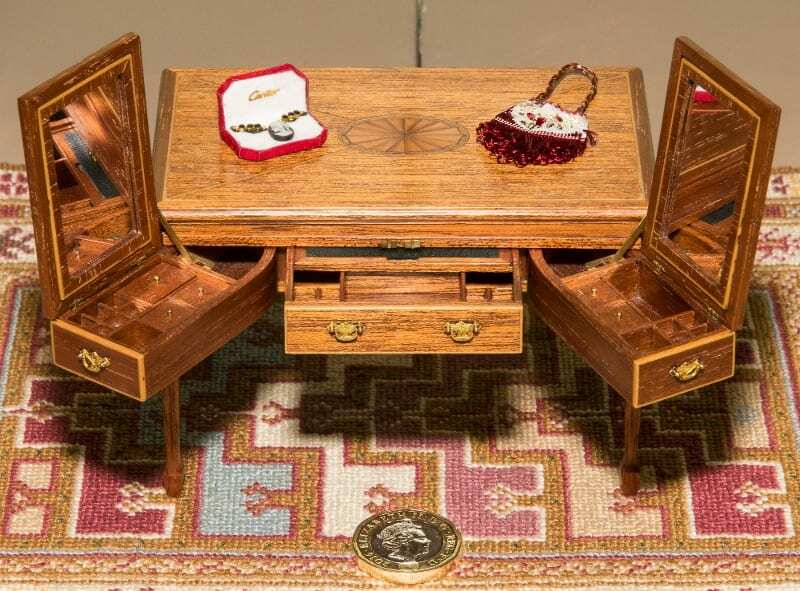 Ann Evans visited the Miniatura Show recently and reminds us that miniatures make marvellous gifts. Miniatura recently held its 71st show bringing together top miniature artisans from all around the UK and abroad. 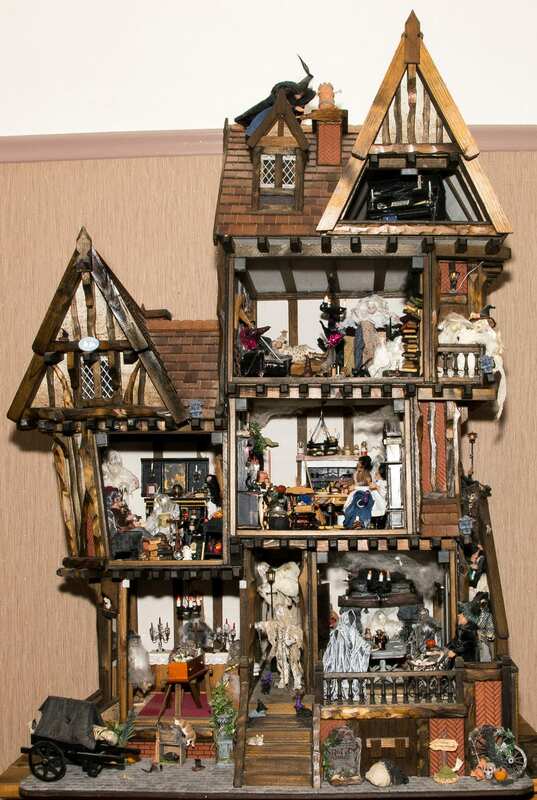 However, you don’t need to own a doll’s house to enjoy the amazing world of miniatures. They make perfect collectables for around the home, sitting as ornaments on shelves, desks and dressing tables. They also make ideal gifts – and as Christmas is on the horizon, why not find out if there’s something miniature you could give to family or friends that ties in with their hobby or work. Maybe dad or granddad has a work shed or a potting shed. 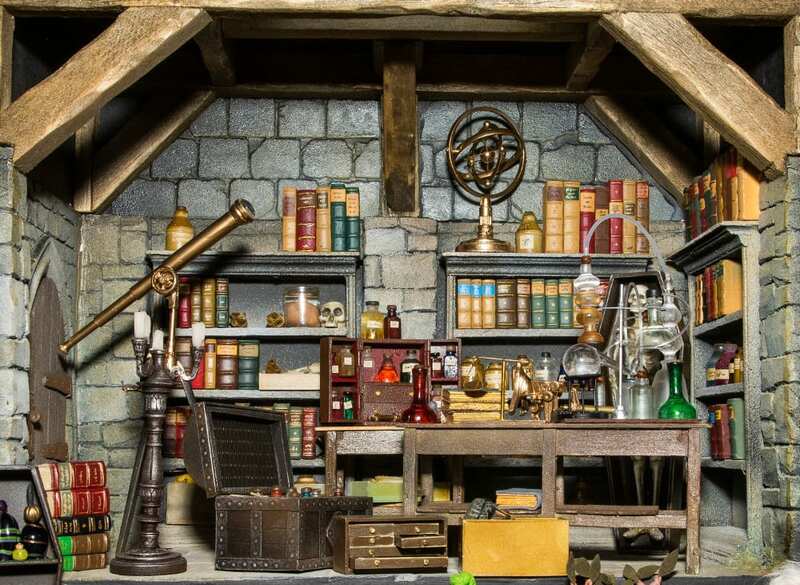 If so, a room box full of tools such as Mike Kelm of Kastle Kelm Miniatures creates would be just the thing. Or, know anyone who’s a book worm? Do you have a friend or relative who’s always reading – or writing? 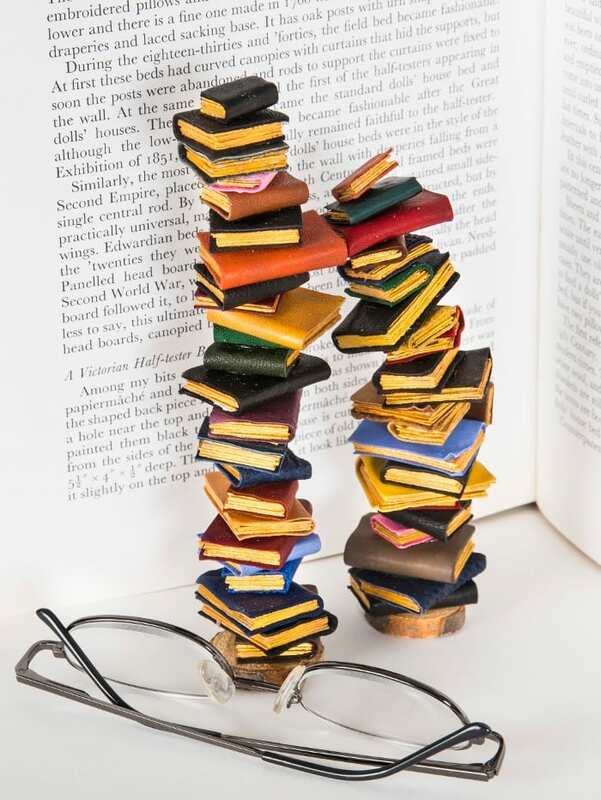 If so, what could be more appealing than a delightful tower of toppling books, this time made from Jenny at Kastle Kelm. Together, this talented duo create all kinds of fantastic fantasy items from steampunk divers helmets, clocks, telescopes and Gothic church organs to quirky witches, wizards, goblins and fairies full of humour and character. 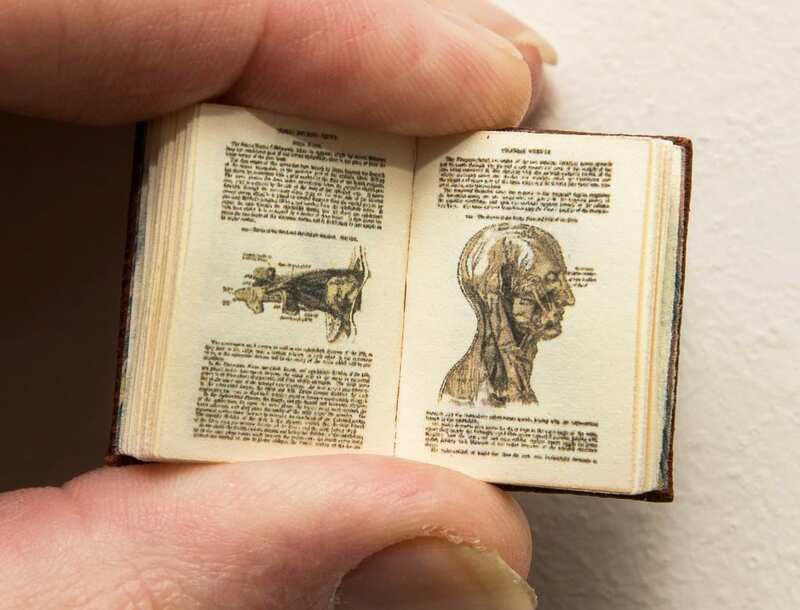 And still on the theme of books, a number of talented miniaturists such as Dateman Books and Ellie de Lacy Miniatures specialise in creating incredible 1/12th scale books. These are often hand stitched in the traditional manner with embossed leather covers, and readable – if you’ve got your glasses! There’s always a fantastic array of dolls and figures for doll’s houses, or just for your collection. 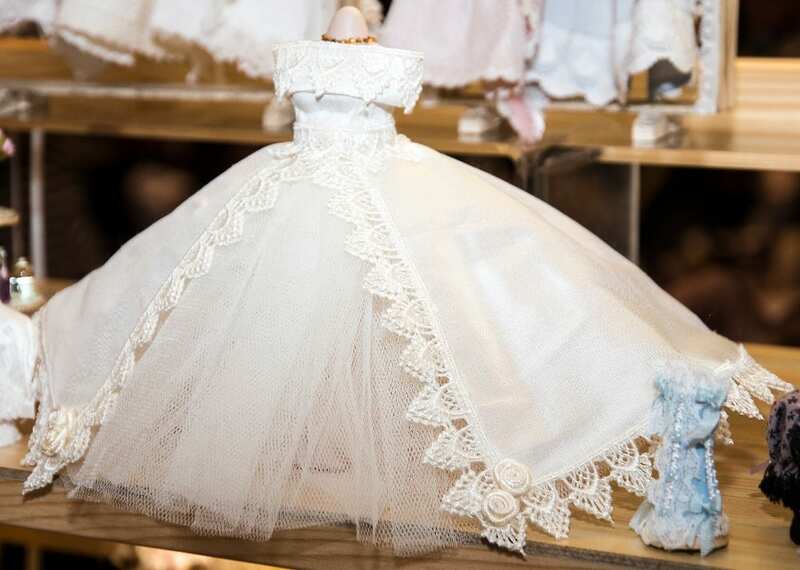 You will find beautiful hand-made porcelain dolls, hand painted and dressed in all kinds of period costume. Whether you love the Victorian era, or regency or Georgian, you’ll find so many that you’ll be spoilt for choice. 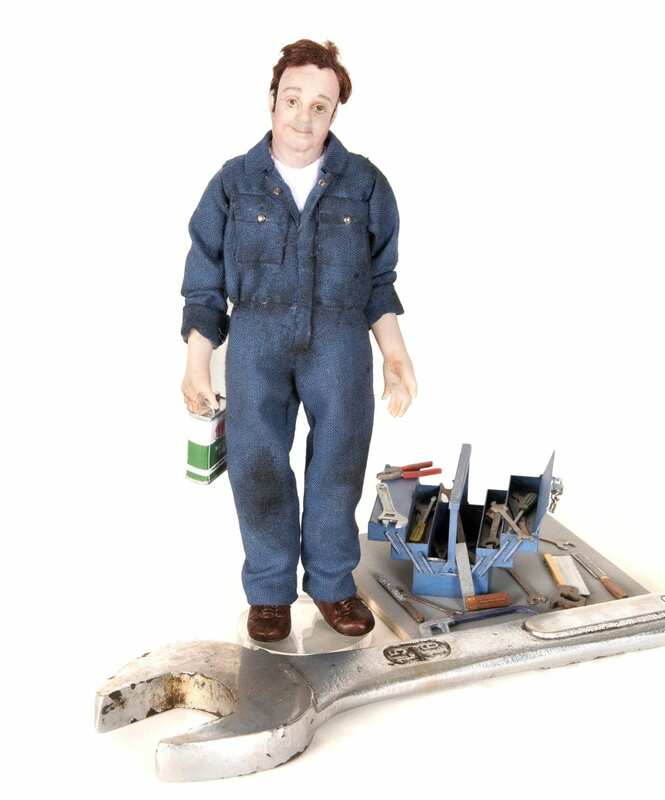 The figures also make wonderful, personal gifts, for example, if your other half is always tinkering with the car, then a mechanic doll made by Julie Campbell would make a unique gift especially teamed up with a tool box from Severn Models. If the TV cookery programmes are anything to go by, we’re all getting into our cooking and baking. 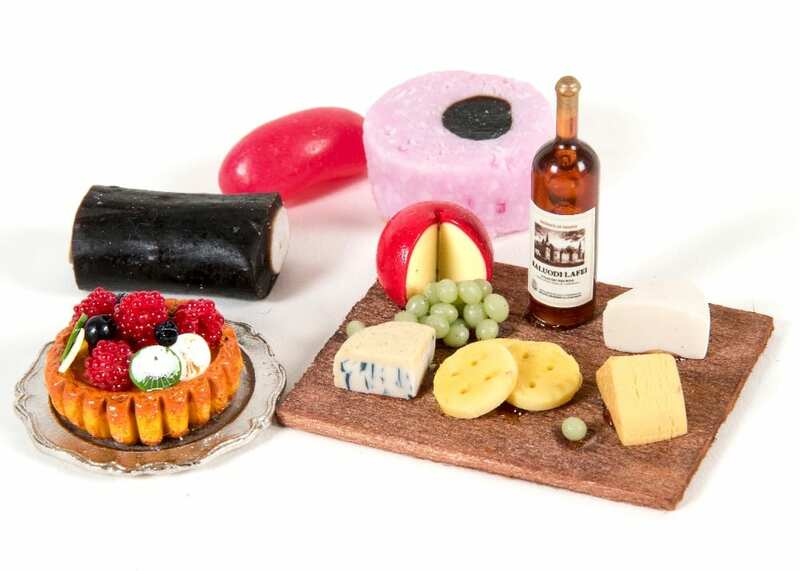 So, you can be certain that miniaturists are also making some wonderful mouth-watering foods that really do look good enough to eat. 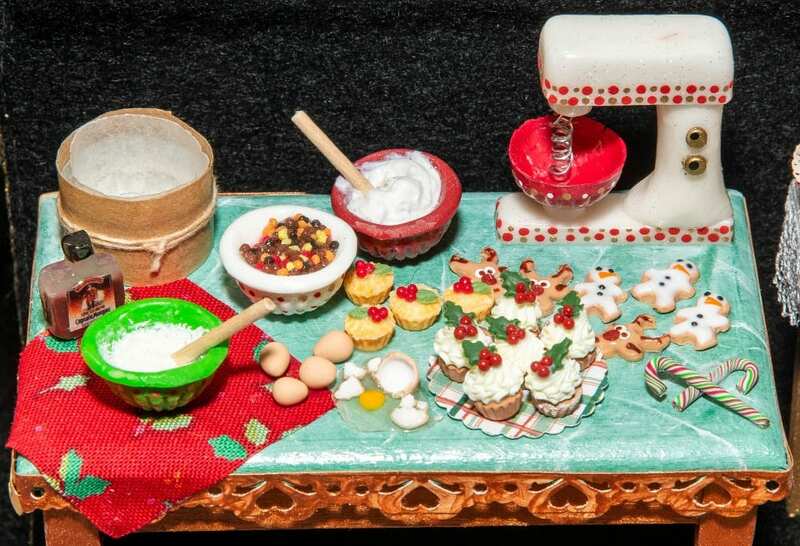 Here’s Ella-Rose Miniatures’ kitchen table showing a festival baking day. Or how about a selection of cheeses from Country Contrasts? Again, no need for a doll’s house – put this on display and enjoy. Anyone getting married in your household? You could treat them to a miniature wedding gown. Made by Kath Knox of Katty Korner. Kath makes the most elegant ball gowns, wedding gowns, hats and lingerie in 1/12th scale, all made from the best Dupion silks. 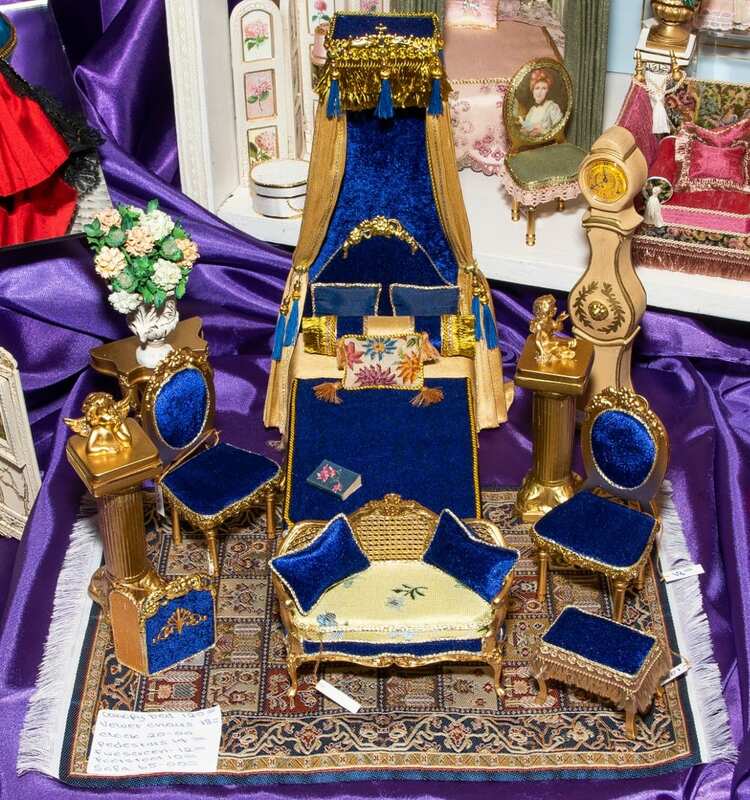 If you do have a doll’s house – and Miniatura is a great place to browse the different styles and sizes, then let your imagination soar with the most luxurious of furniture and furnishings. The wonder of these skilled artisans that you’ll find at this show, is that they work to scale, that’s not just in height and width, but also in the thickness of the materials right down to the grain of the wood. You could create a palace if you wished, or an upstairs/downstairs Edwardian household; or how about a haunted house? It won’t be long until Halloween is here, and crafty sisters Tina Baz and Andrea Horner alias Twisted Miniatures love making all things spooky and ghoulish. 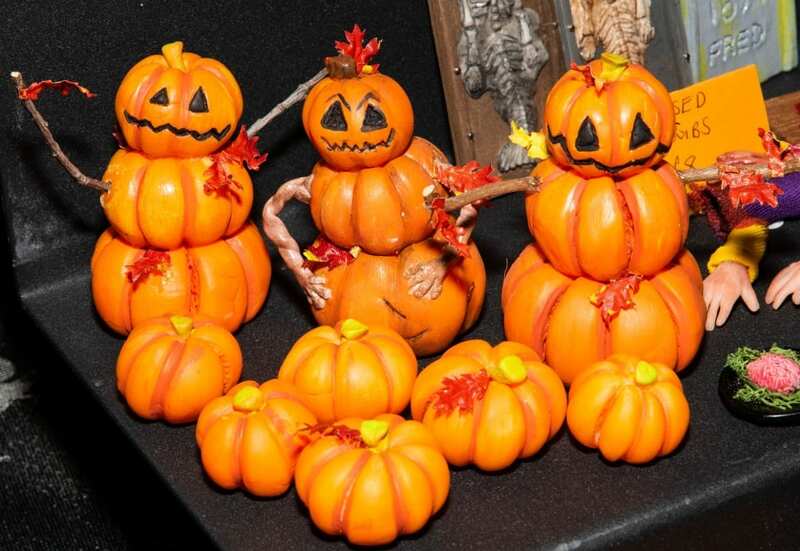 Visit their website to find everything from miniature pumpkins to zombies, from skeletons in deckchairs to fridges full of all kinds of nasties – in a nice way! 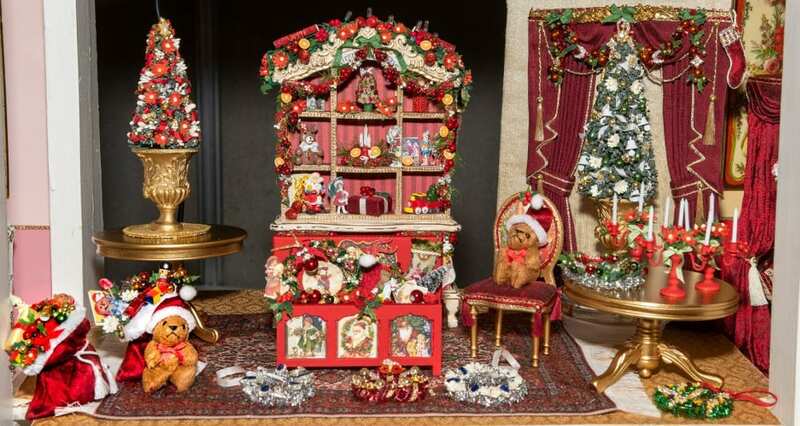 And of course, Christmas is coming, and Christmas miniatures are a real delight. Sparkling trees, dusted with snow, a table filled with Christmas fayre. 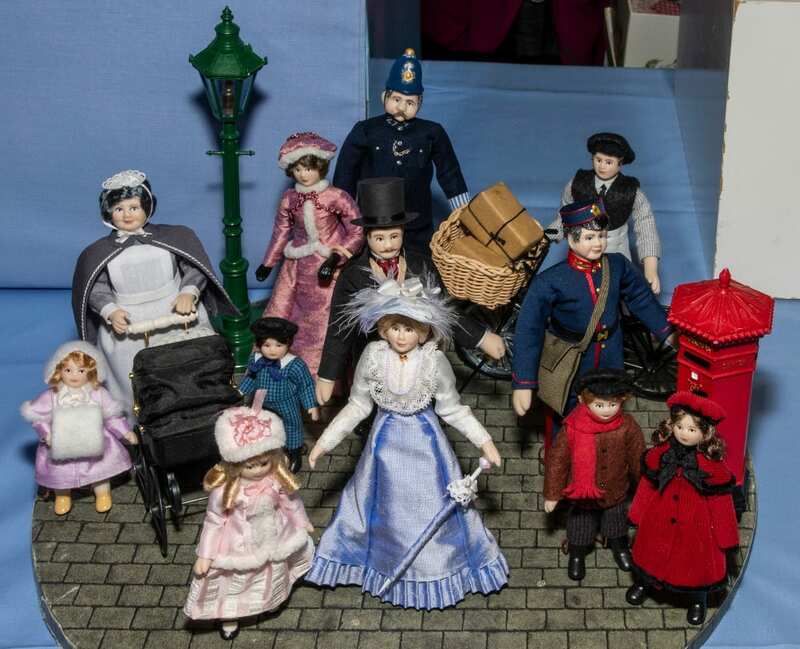 You could create a scene of carol singers with lanterns, or a Dickensian shop window filled with toys. A dreamy Christmas scene would make a perfect table centrepiece. The joy of miniatures allows your imagination to run free. Create miniatures worlds for yourself or others. Maybe give it a try yourself. The Miniatura Show always features friendly talks, workshops and demonstrations from those who are more experienced in their particular field. Miniaturists are always willing to share their knowledge and expertise. And of course, there are books and magazines where you can discover more.